Better start gearing up now! Is it even Hari Raya without some Tart Nanas, Samperit, Bahulu and other cookies? Let’s make it a remarkable Hari Raya by making your own Kuih Raya from scratch! You definitely don’t want to miss out on these important appliances and tools for baking your kuih. Who here agrees that mixing and whipping your cookie batter is a form of a workout? Let’s skip all that, especially while you’re fasting, by using this mixer by Khind with a 5-speed setting for making dough, beating eggs and mixing to increase the production of your cookies. With this, all your guests can enjoy your home baked goods. This adjustable rolling pin makes it easier for you to roll out the dough of cookies, pie crusts and pizza to a uniform thickness. It's much more hygienic as it will not absorb colours, odours or flavours. Furthermore, you don't even need to crowd your kitchen cabinets with rolling pins of different shapes and sizes. Additionally, the rolling pin's spacer will be not split or crack after many uses under heat and water. Garnishing your cake and pastry with sugar icing can be a very messy process. Save yourself the trouble of cleaning up with this sifter. Besides, it's also a great way to remove clumps and debris from flour. Pouring batter into cupcake paper holders can get messy, and the clean up is tedious. Thankfully, this batter dispenser jug will make your job easier; loading your mixture will be a breeze. Besides, you can even add small berries and chocolate chips to your jug for dispensing. The heart of cooking is putting in the correct amount of ingredients. The easy way to never go wrong is by measuring your own ingredients according to the recipe. This electronic kitchen scale comes with a bowl for you to weigh the ingredients needed. Plus, digital numbers are easier to be read compared to analogue scale, yes? I bet no one can recall any house that doesn’t serve pineapple tart. Why don’t make your very own Tart Nanas specially baked from the heart to all your guests on Hari Raya? This durable mould can help you to make a perfectly shaped tart to serve this festive occasion. Well, of course, an oven is the most important tool to make it all happen. This oven by Trio has an extra-large capacity so that more cookies can be baked at one time. Even when Raya season is over, it still can be used to prepare other food such as pizza and steak because it’s able to bake, grill, cook, and roast! Let’s go way back to when our grandmothers would make bahulu on their own to serve the guests because anything freshly made is always the best choice. This bahulu mould is one of the traditional tools used to make kuih Raya back in the day. It’s durable and easy to wash, so you have no excuses not to make bahulu every year! This measuring spoon set helps you measure small amounts of ingredients precisely – you don’t have to eyeball it anymore. It comes in a set of six with measurements ranging from half a teaspoon to one cup. Additionally, the cheerful assortment of colours is also sure to brighten up your kitchen! If you are aiming to make some samperit this Hari Raya, we’ve got just the thing for you. This is the Holy Grail product for achieving that perfect samperit shape. 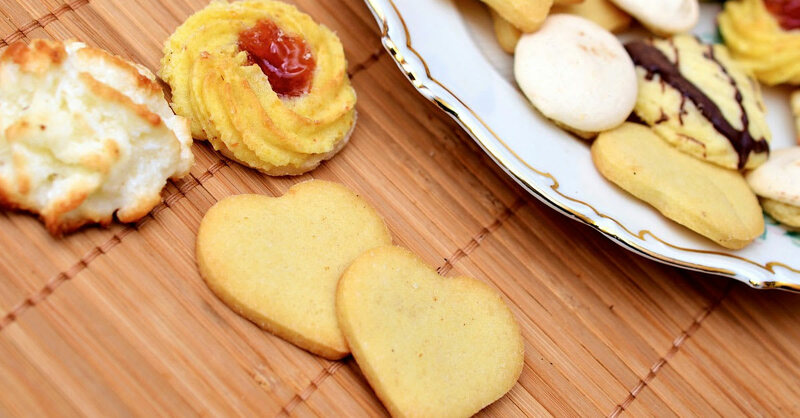 Making Raya biscuits have never been this easy!